To say this final month of marathon training has been uneventful, would be a total understatement! Week 1 – I’d been craving banana bread all weekend and because bananas don’t last long in our house, I had to go out to find the brownest ones I could! I used the recipe from the Run Fast Eat Slow cookbook, which I can’t recommend enough, and thought it would last me at least half the week. Oh how I was wrong…my mum and I pretty much devoured the loaf in a matter of days! Admittedly the rest of the week didn’t really go to plan. 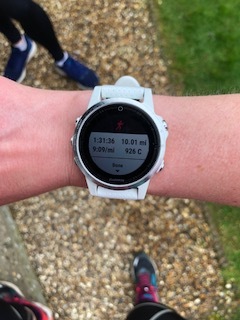 It was the Easter weekend and we had planned to visit my godmother where I would also do my 20 miler run (you can read more about that on my last post). I missed my morning run on Tuesday, so ended up going out in the evening with friend. Well, that was a bit of a disaster but getting out and just running was definitely what I needed. A much needed rest day and sports massage was planned for Wednesday, and Thursday an early morning interval run, watching the sunrise, was enough to kick me back into the game. Friday morning we headed up North for a fun weekend of catching up, running and lots of Easter egg eating! Week 2 – Bank holiday, and a much needed one if that. I joined Charlie for some shake out miles, before heading home for a bath and a long foam rolling session. My first run after my 20 on Saturday, and my legs felt really good. However, things suddenly changed and the following morning I woke up feeling very unwell…I just about made it into work and within an hour I was leaving to return home to my bed. I felt horrific. With lots of sleep and rest over the next few days, I definitely felt better, and returned to work and running but slowly. A light, but very sweaty training session on Friday was much enjoyed and by the start of the weekend I was feeling myself. Then I ended up with no voice. I thought nothing of it and spent the day in London with a friend, running and going out for lunch. 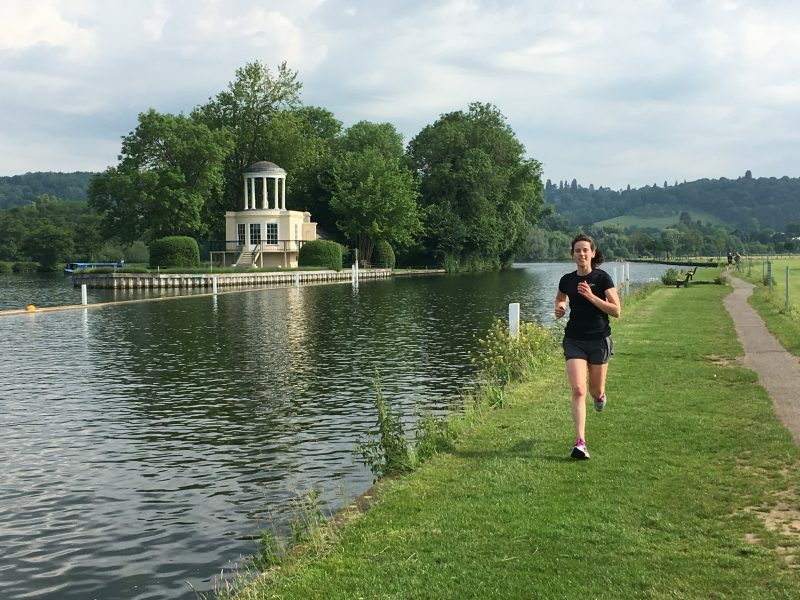 It wasn’t until that evening, that I ended up on the phone to the local out of hours hospital where I was told I had laryngitis…Great, now I was really panicking… Not the best timing, 2 weeks before a marathon, but actually it was. I had 2 weeks to get myself better, the training had been done and all there was left to do was sleep, eat and keep my legs moving. 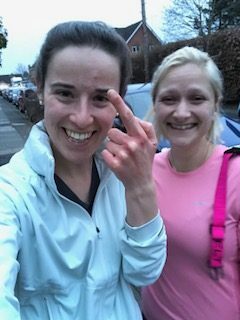 I was determined to do my last run, 10 miles, with my friend and that is what we did. We took it slow and the rest of the day I spent at home catching up with my Grandma. Week 3 – This week started off with a very easy reformer pilates class. I haven’t been to one in what felt like ages, but I fancied a change and booked in last minute. 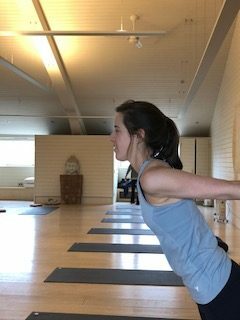 It was a very quiet class, of 3, and we focused on hips, hamstrings and abs – perfect! Tuesday morning rolled around and I treated myself to a lie in, as I was meeting Charlie for a run that evening. After a testing day at work, for both of us, it was JUST what we needed. My usual rest day on Wednesday was enjoyed at a friends house, and an evening on the sofa. I managed to sleep quite well, as the following day was my birthday!!! I started the day off with a long interval run, followed by breakfast with a nanny friend and our charges. After work I went out with my mum for lunch and spent the afternoon opening presents and eating THE yummiest vegan coffee and walnut cake I’ve ever had! My birthday celebrations continued onto the following day at Daylesford Farm in the Cotswolds. I went with my mum and a friend, where we stretched our way through a yoga class, ate delicious food, drank the tastiest coffee and treated our feet and legs, to one of the best pedicures I’ve had! I felt like I had treated my lower body like a queen and felt extremely relaxed when we left. Yesterday was another treat day for my legs. After the best lie in, I popped to GoPerform, a sports injury clinic in Reading, to use the NormaTec recovery boots. Followed by a coffee in the sunshine and some diary organizing. A beautiful warm and sunny day, that I spent enjoying the rest of in the garden before heading out for dinner with a friend! To end the first week of taper, and prepare for the final week of training, Charlie and I enjoyed an 8 mile run along the river ending at one of our new favorite coffee shops in town. Our final last long run, a gentle pace and much enjoyed. I’m feeling super excited and ready for London now. I feel strong and my body feels great. This week I’ll be focusing on sleep, hydrating lots and eating nourishing and filling food. I hope you’ve all had a lovely weekend and enjoyed the beautiful sunshine we had. Have a great week!